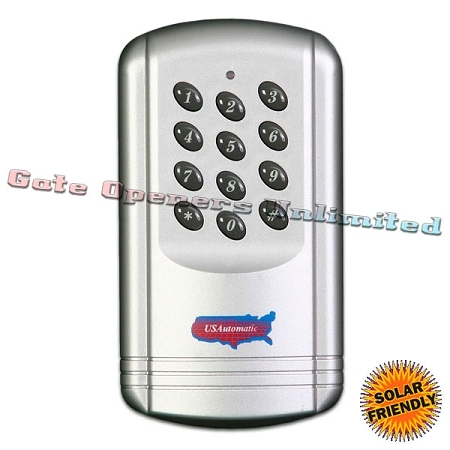 Used to open or close the gate by using a secure pre-programmed code. Up to 24 different codes possible. This tamper-resistant, weatherproof, programmable Multi-code Wireless Keypad can be mounted outside your gate and offer convenient access without having to carry a transmitter. The Wireless Keypad 050520 is designed for outdoor wireless installation. Easy to program and working well - very pleased. Service was excellent! Keypad was simple to install and has worked just fine. I heeded comments from some other users who had experienced some problems with moisture, and since it is out in the Texas rains, I covered the top of the post and keypad with a clear plastic bag just to be 100% certain. However, the unit appears to be reasonably well sealed - of course it is imperative that the backing, which seals the unit, be properly aligned so it seals against the wall/post (perhaps that was the issue those users were having). For me though, it just didn't seem worth the risk of running a test to see just how water proof it is (especially given the historic rains here this past month! ).